Suits tend to be the perfect wardrobe for men especially for those who look to flaunt their own style. From birthday parties to funeral gatherings the attire has occupied a predominant position in making man highly stick to the outfit madly. It became the inevitable attire such that men believe only suits can bring them the royal touch and elegant presence. The fashion keeps on changing day by day and one could see its impact highly reflected on apparels tremendously. 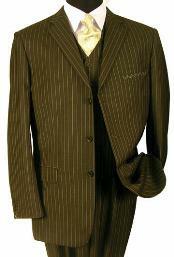 One such attire that is been on top of the current trend list is the pinstripe three piece suits. The pinstripe three piece suits are the aesthetic formal as well as the casual wear of the modern men’s wardrobe. The type of suit can be otherwise defined as the resurgence of the waistcoat as the new found popularity of three piece suits is nothing but the updated modification of the older waistcoat type. The current pinstripe three piece suits comes in a cohesive pattern where the same fabric is been used as the suit’s other two pieces. How to select the right pinstripe three piece suits? Choosing the right apparel is always been a hectic task for many people as they find the money what they spend on clothing worth nothing. While buying a pinstripe three piece suit it is highly advised to buy for a waistcoat which has V shape breaks somewhere between the sternum and the base of the rib cage. This gives the wearer a perfect fit and a fine manly look. There are certain branded companies like Giorgio Armani which pose three piece suit collections that do not sport the V shape breaks making it a bit conservative on the wearer. How to decide on the fabric? The kind of fabric used determines the overall look of the suit pieces. The three piece suits are available in different modes of fabric ranges such as wool, cotton, linen and velvet. If you are picking wool suits, it will be quite expensive than the other collections as the cloth is being made from the superior blend of super worsted wool. The thread count will be somewhere between 120 and 150. If you are choosing cotton suit then it is advised to go for black, grey or other tan shades which would suit perfect on any kind of skin tone. Zegna and Ralph Lauren’s black label three piece suits are the best when compare to other brands. Linen and velvet types can be chosen as per the buyer’s wish. If you are picking three piece suits then you have wide array of patterns to check it out. The highlighted type patterns include: Glen plaid, Damier check, Harringbone, Harris Tweed, Pinstripe and Rope stripe patterns.